The lottery seller Sunil Shantha, travels by bicycle every day to remote villages in Divulapitiya, an electorate which has polled Blue for the better part of 21 years. Shantha, in his mid-sixties, remembers when UNP representatives like Ariyaratne Jayatillake were unshakable forces of power in Divulapitiya. 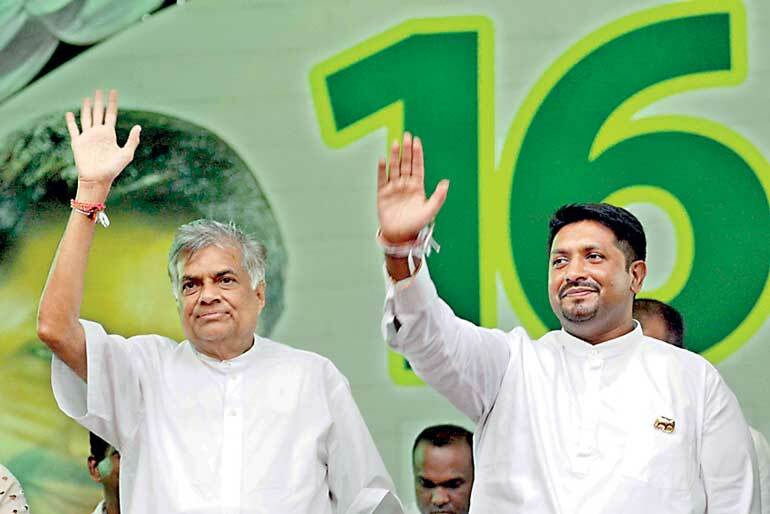 But the UNP’s long winter in Opposition turned the Gampaha District electorate into a sure win for SLFP-led coalitions over the past two decades. But Shantha, who bicycles out with his ‘sweep tickets’ to the villages of Maradagahamula, Kalapitimulla, Kehelella, Momaluwa and Thammitha each morning, says he feels something changing on the ground. 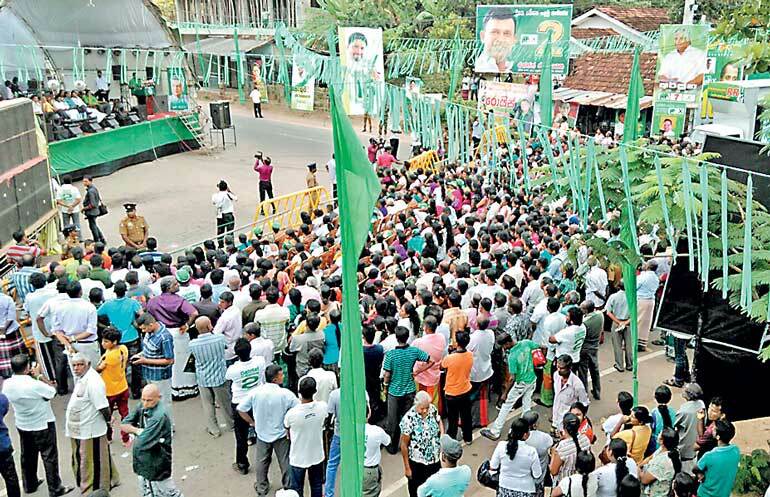 Residents claim the return of one of Gampaha’s sons to lead the UNP campaign in the Divulapitiya electorate has led to the party’s resurgence in the region. Ranjan ‘One Shot’ Ramanayake, with his movie star appeal and straight-talk credentials is attracting large crowds around the district. But if he manages to flip Divulapitiya or narrow the gap between the UPFA and the UNP significantly, Ramanayake could decide the fate of his party’s fortunes in the Gampaha District. The UPFA campaign has been severely hit in the region, residents say, by the party’s failure to field candidates like Samanmalee Sakalasooriya, a provincial councilor who is widely popular with SLFP supporters in the area. The Divulapitiya organiser for the UPFA is actress Upeksha Swarnamalee, who just can’t compete with Ramanayake’s star performances, says Shantha Kumarasinghe, who owns a local eatery just off the Divulapitiya town. “The invasion of the UNP is already complete. Upeksha Swarnamali is the electorate organiser for the sandhanaya in Divulapitiya, but no one even sees her around. She has held no rallies or meetings. The only UPFA candidate making any impact in this area is Indika Anuruddha. But even he can’t compete with Ranjan Ramanayake’s popularity,” Kumarasinghe explains. 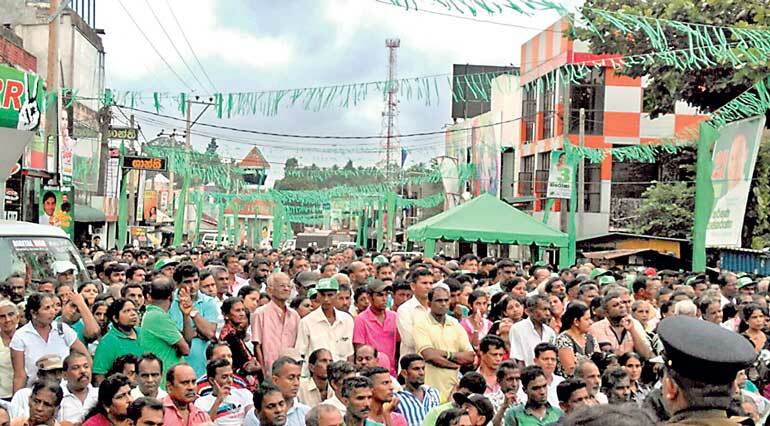 On Tuesday afternoon, Divulapitiya has gone green in anticipation of ‘Ranja’s’ big rally in the town centre, with UNP Leader Ranil Wickremesinghe and Gampaha heavyweights Arjuna Ranatunga and John Amaratunga expected to attend. “At this point, it looks like Ranjan Ramanayake will carry the electorate,” says garage-owner H.A.D.S. Kumara, grimly. Kumara admits to being a long-time SLFP supporter, and regrets he cannot work for Western Province Chief Minister Prasanna Ranatunga who is campaigning heavily in the Minuwangoda electorate. 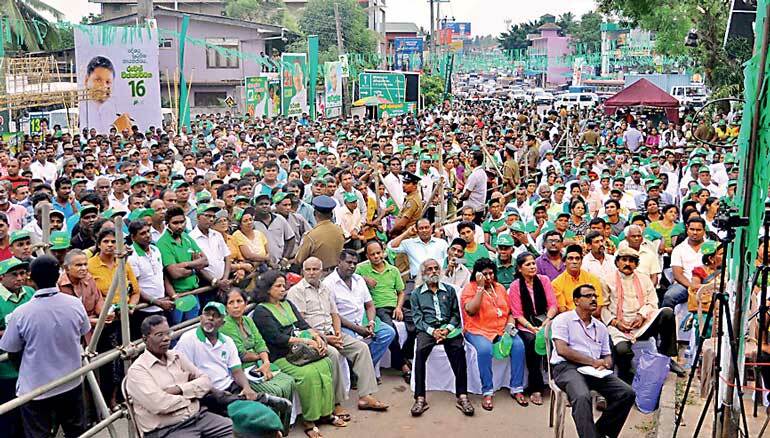 “Mahinda Rajapaksa returning to contest has just driven votes towards the UNP,” grumbles Kumara, who is in two minds about closing his garage early because of the massive rally organised in town. “This is a very close fight now,” he admits. With parties engaged in heated battles for preferential votes, Ramanayake insists UNP candidates are cooperating in the district. He and State Minister for Defence and Biyagama Organiser Ruwan Wijewardane campaign together, and their electorates are open to each other to cavass votes, he says. “Ruwan is like my brother. He is a clean and uncorrupted politician. I am not ready to get into preferential vote wars with candidates like him, I think whether he comes first and I come second, or I come first and he comes second, it won’t matter to either of us,” the actor-politician says. Ramanayake says party leader Ranil Wickremesinghe handpicked him for Divulapitiya because it posed a major challenge for the UNP in the district. 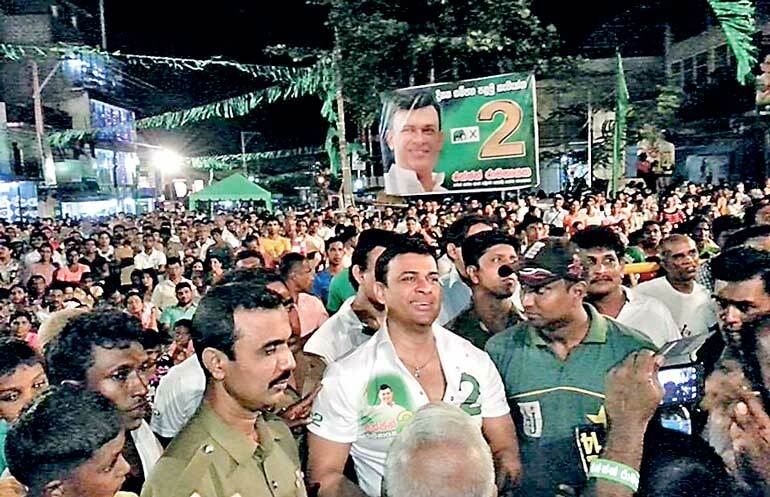 “He could have given me Katana or Negombo, where I schooled, but he said those two electorates were already in the bag for the UNP,” Ramanayake tells adoring crowds at his rally yesterday evening. 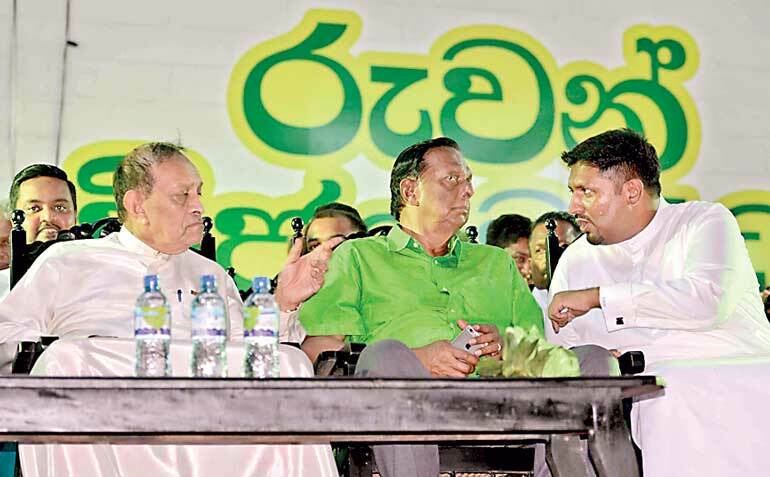 “He wanted me to take up a challenge, and I gladly accepted – now from the crowd here today, it looks like One Shot has done his work and the UNP will win Divulapitiya for the first time in 21 years,” the popular actor and politician said. But the battle is by no means won in the true-blue electorate, despite trends emerging of a tight race. 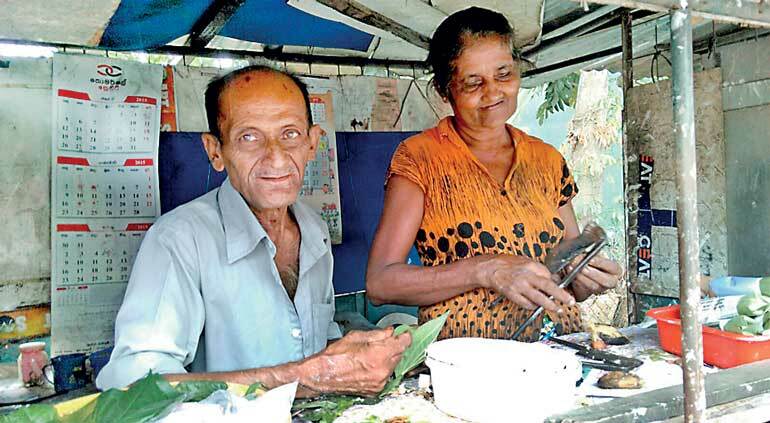 Betel Leaf seller Siripala chats passionately about SLFP politics while his wife Malathi slices areca nut with her giraya in their tiny shop next to the main Divulapitiya bus stop. “This is a good old left seat,” says Siripala, his hands cons tantly smashing nuts and wrapping up leaves. “It is very hard to convince people to vote UNP in Divulapitiya,” the old man says. According to Siripala, Mahinda Rajapaksa is the reason they are able to conduct their businesses in peace, with no fear of bombs going off. “My heart tells me that the UPFA will win, but maybe that is my hope,” Siripala grins. He is a firm believer in the former President’s innocence in alleged corruption scandals. Asked why he thinks Rajapaksa lost the election in January, Siripala asks sagely: “Are you supposed to be responsible for the sins of your siblings and family members?” Both main parties are filled with corrupt politicians, the old betel seller says. A few kilometres away in Minuwangoda, Western Provincial Chief Minister and UPFA Gampaha strongman Prasanna Ranatunga appears to be holding strong to his support base. U. Chandana runs a small juice and pastry shop right opposite Ranatunga’s Udugampala home and campaign headquarters. “I don’t know what the situation is around the district, but in Minuwangoda most support is for the Chief Minister,” Chandana. The small businessman explains that Ranatunga has been actively helping people in the region. “Some people have changed, that is for sure, but it will be hard to defeat the Chief Minister here,” he said. Ranatunga has been one of former President Rajapaksa’s most loyal supporters within the party, nearly losing his chance at the nomination as a candidate in the 17 August election as a result of his unwavering allegiance. Speaking to Daily FT in his small but stylish home, Ranatunga launched a scathing attack on former President Chandrika Kumaratunga who hails from the Gampaha District. Kumaratunga has fallen foul of Rajapaksa loyalists, after she made a four-page appeal to SLFP voters, urging them to defeat Mahinda Rajapaksa to rescue the party. “Chandrika Kumaratunga is SLFP in name only. I challenge her to say what she has done in recent elections to ensure the victory of the SLFP,” Ranatunga said about his former Party Leader. He vehemently denied that there was any impact to the UPFA’s electoral fortunes from Kumaratunga’s statement on how SLFP supporters should vote in next Monday’s poll released last week. 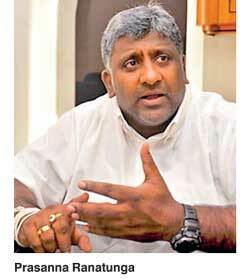 “In 2005 and then again in 2010, Chandrika sabotaged Mahinda’s campaigns,” Ranatunga claimed. He said that the former President had also tried to deny him the UPFA nomination, after the FCID summoned him for questioning during the nominations period. Ranatunga insists that the former President is the real key factor in Monday’s poll. “At rural levels, people are with Mahinda Rajapaksa and there is a groundswell of support for those who stood with the former President even against very popular figures in the party,” he explains. The Western Province Chief Minister is confident the UPFA can win 16 districts in the island’s south. The Gampaha District, Ranatunga claims, will poll UPFA with a majority of 60,000 votes, a tough goal, analysts say, for a party that lost the district by 4660 votes in the January poll. Ranatunga claims it is always more difficult to win elections when a party has state power. “Last time we were in a bad place. All these years we won elections on the back of the war victory. But in fact it is easier to win elections when you’re in the Opposition,” the Chief Minister said. The UNP Government had become increasingly unpopular over the past seven months he said, making it easier for the UPFA in this election. About the corruption allegations against him and his wife, Ranatunga says they are all fabrications that are breaking down in court. “I am a businessman and I run legitimate businesses. There is no way we can live off a politician’s paltry salary. I was called in for questioning by the FCID so that the party could deny me the nomination. But I was able to fight back in Supreme Court and the FCID finally said they could not file charges and the matters would have to be transferred to the Bribery Commission. I will take this fight to the end to clear my name,” he vowed. The battle of the Ranatunga brothers is making things more interesting in the hotly contested district. Prasanna and Ruwan Ranatunga campaign together as UPFA candidates, but former cricket skipper and Maithripala Sirisena loyalist Arjuna Ranatunga is staking his own claim for a major share of votes in the district. Arjuna has broken with an old family tradition by contesting for the first time as a candidate under the UNP and the elephant symbol. “I’m a policy-oriented politician. I am not hung up on parties, I can’t contest among corrupted politicians, if the party is doing the wrong thing, I will get out of there,” says Captain Cool, who admits the decision to contest under the elephant symbol was difficult for his family to digest. 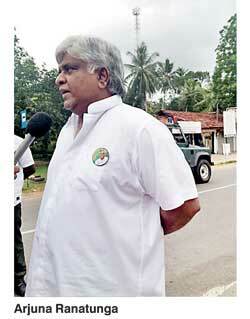 Arjuna Ranatunga, who also attended Ramanayake’s Divulapitiya rally yesterday, is confident the UNP can carry the Gampaha District. He is a deeply disillusioned man about the hijacking of the SLFP by the Rajapaksa faction, which he says has prevented any reform. “Today the SLFP has been destroyed. Smaller parties have come in and just dissolved the SLFP and everything it stood for,” the former cricket skipper charged. He hit back against his brother Prasanna Ranatunga for his onslaught against President Kumaratunga. Arjuna Ranatunga claimed Kumaratunga had been instrumental in reversing electoral trends in the Gampaha District in January and giving the Sirisena coalition a victory in the region. “Chandrika still has major attraction in Gampaha,” Captain Cool said, dismissing his brother’s diatribe as just political talk. Nobody had Kumaratunga helped more in the Ranatunga family, than Prasanna himself, he claimed. “The trouble is that when Chandrika Kumaratunga speaks, the corrupt politicians inside the Mahinda camp get very nervous,” he chuckled. 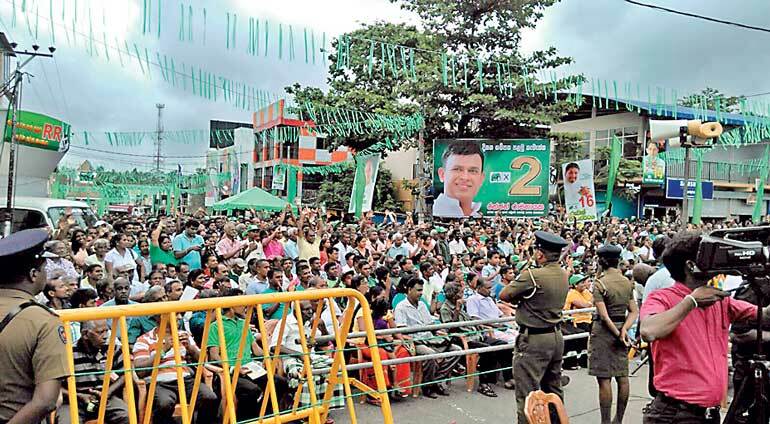 Around the district, the UNP claims it is drawing big crowds while UPFA rallies are significantly fewer in number and lacking in glamour compared to what they once were. Wijewardane and Ramanayake are attracting crowds of supporters well past 2.00 a.m. as the race draws to a close. But the UPFA insists it retains massive support in the district’s more rural regions. In this battleground district, Monday’s crucial parliamentary poll is still too close to call.